An trio of official videos from Samsung reveal some new design, hardware and camera features for the Samsung Galaxy S6 and Samsung Galaxy S6 edge. One of the interesting features on the Galaxy S6 edge is called People edge. Each of your top five contacts is assigned a color. When a notification is sent from one of the top five, it lights up the extra curved side of the phone so that you know who is trying to contact you, even if you are in the process of doing something else with the handset. The aluminum used for both phones is the same one used to build airplanes. And Sammy even gets in a shot at its top rival. Speaking about the aluminum the announcer says, "Basically, this stuff will not bend." Another shot at the Gumby-esque contortions that took place on some Apple iPhone 6 Plus models. Other features mentioned include secure container KNOX and mobile payment service Samsung Pay. Another video was centered on the stuff that we can't see inside the phone. 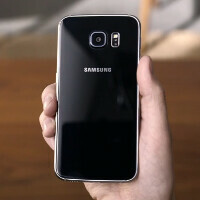 That includes the 64-bit octa-core Exynos 7420 chip made using the 14nm process. The video also discusses the 3GB of DDR4 RAM. And using Fast Charge, plugging your phone in for just 10 minutes will give it four hours of battery life. The last video focuses on the camera (no pun intended). The 16MP rear camera and 5MP front-facing snapper both offer an aperture of f/1.9. This means that both can handle taking photographs under low-lighting conditions. Double click the home button from any page to quickly launch the camera. And of course, OIS allows you to take smooth videos even if you're being jostled while filming. Take a few minutes to view all three videos which are found in the video slideshow below. you should give it a try when it comes out. see if you like it or not. To be honest, samsung has really fixed it's major drawback for its flagship device, the build quality and the design, and now it is a near perfect device for those who complain the lack of SD card slot as well as a non-user replaceable battery, samsung obviously chooses to impress the general public at large, instead of a small niche market of geeks. even i'm considering switching back to samsung albeit having awfully bad experience with the galaxy s3.. you can't have the best of both worlds. The HTC and Sony devices give the best of both worlds: Long lasting batteries, excellent build quality AND expandable storage. So you CAN have the best of both worlds. But they dont have super amoled and touchwiz.. once you get used with all the features touchwiz has.. all other android skin feels boring.. same like amoled.. once you get used to amoled screen, other lcd looks dull..
& Sony phones are selling so well! You can not know, how large is the general public! Most People don't understand, that we use the SD cards for the media and NOT for the apps!!! I really hope this one will FAIL, so that Samsung can realize what mistakes they did!!! The S6 edge is just stunning. Samsung actually listen to their customers. No more plastic bashing from haters. Thanks you Samsung for leading innovation. the edge part of the s6 edge is plastic. the plastic never bothered me anyway so it doesn't even matter. I know you feel hurt inside..
great! unfortunately, samsung is already in a decline. it's difficult to rise again once you start falling. hopefully it wouldn't be the case. i don't really want those chinese brands rising. They had a great run though. It would take a spectacular stroke of luck plus a miracle for them to get back where they once was. I think their market share will fall a little more this year. The Chinese are eating up the low end. But they will make more in profit. Using a lot of in house components keeps the money in the family. Gotta wonder how much each snapdragon chip costs. Multiply it by millions. That's money saved in a sense. Unfortunately for Samsung, they can't come up with a good low/mid end phone because they're too afraid it might cannibalize some of its popular models, in a sense...they will NEVER going to make a good low-mid end phone. The new front and rear camera is the only thing I like about this phone. I wish the HTC had a simular set up. That seriously looks pretty game time. The only area they probably could have done better is on the software side. A gpe edition of the edge would be sick. Although a Nexus based on the ascend p8 would be sick too. Wouldn't that negate the benefits of the camera? I've used the Google camera app on a Note 3 and its just not as good. The S6 especially has some nice camera features that Google camera can't do. Both are great phones in design language. But it doesn't seem to mean a lot for Project Zero; it still takes its DNA from the S5. I'm going to wait for the Note 5 since I prefer bigger screen, furthermore I wish Samsung put back the SD Card option. Maybe my next samsung after S3 ! Personally I think the Alert system on the edge is an gimmick. Who put's thehre phone down on the glass!!! My brain screams scratches..... GG4 is just nothing more than a marketing gimmick. To be fair don't use the word gimmick because it's one of those scenarios where you would accidentally forget the phone upside down. A call comes in and you will know exactly who is calling. We don't always leave our phones lying on the back. Anything happens. Just be glad the feature is there. It can come in handy. Don't always reject new ideas and innovation. It doesn't hurt if it's there. If you won't use it don't but don't hate on it. My old Samsung fanboy self is walking through cobwebs right now. Really wish I'd be impressed with the GS6 when I see it in person.